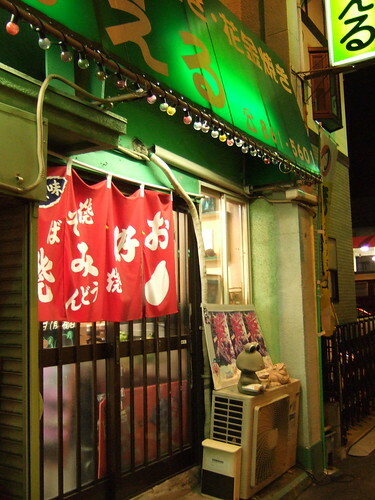 Photo: Kaeru on Route 16 in Old Taura. Kaeru means both “return” and “frog” in Japanese. The mistress of Kaeru was born in Hiroshima and misses her hometown (hence she is yearning to return). The night we went she was alarmingly battered and bruised from a fall down the stairs (something to do with her dogs), but she was in good spirits. When we asked about the name of her place, she cheerfully asked us, “Don’t I look like a frog?” Actually, she does, but I refused to say so to her face. I just laughed politely and drank my beer. She has been running this tiny, very local, somewhat untidy, yet comfortable place for ten years. Her husband is in the Japanese Navy (ok, technically the Japanese Maritime Self-Defense Force), and we had a good discussion about Navy life. She has a sizable collection of frog statues, stuffed frogs, and frog memorabilia. She also collects Zippo lighters. This is not a sterile business; it’s a lived in place, full of memories and personal touches. Madam Kaeru (I neglected to get her real name) serves Hiroshima-style okonomiyaki, which is quite different from the more famous Osaka style. Osaka style has a lot of batter (made of yamaimo and flour). Blue Lotus has a good post on the standard pancake, with a separate link to a recipe. 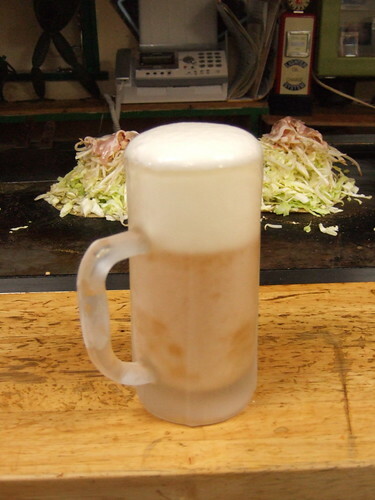 Hiroshima style—or at least the style she serves—has very little batter. Her daughter (pictured, who very much does not look like a frog) made a very thin crepe of batter on the grill, sprinkled a good amount of dried sardine powder on top, and then topped that with a huge mound of shredded cabbage and bean sprouts. 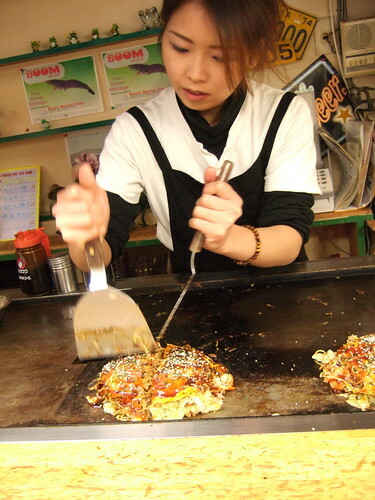 Photo: Building a Hiroshima-style okonomiyaki. After the cabbage and the bean sprouts, she adds whatever additions you would like. We chose bacon and shrimp. She said next time we should order the house special of mochi and cheese. Once the cabbage and bean sprouts cook down a bit, she cracks a whole egg on the grill, breaks the yolk with her spatula, and quickly spreads it into a perfect circle the same size as the pancake. Then, she flips the whole pancake onto the egg. She adds a layer of either udon or soba (yakisoba, made of wheat, not buckwheat soba). She incorporates the second ingredient you ordered (in our case, some grilled shrimp went into the pancake). She flips the whole thing over again and garnishes it with okonomiyaki sauce, a handful of dried bonito flakes, and sesame seeds. Finally, she quarters it and adds some mayonnaise on top. The whole time her daughter was cooking, Madam Kaeru was backseat cooking, “Not so much. Don’t forget the sauce. Press on it more.” It was delicious. We drank, we chatted, we stuffed ourselves. We thought we had put away a good amount, but the Japanese couple at the table behind us ate two whole pancakes each. This ain’t no kaiseki place, friend. OMG that looks so delicious! I really want one! 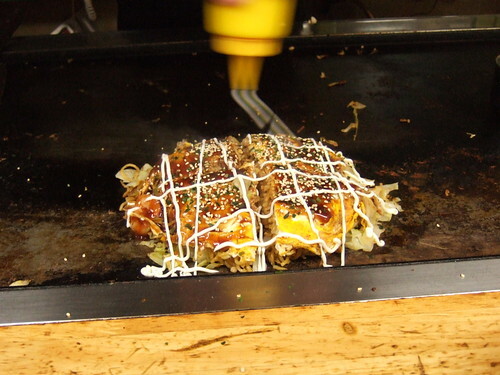 Agreed, and the okonomiyaki seems so complex, layers and layers of flavors. Neat that you are sitting there in front of the cook. I guess it would be akin to pulling a cook in am American diner out front to fry up the burger in front of you… only the daughter looks more appealing. In these and other exchanges, are you carrying on your conversations solely in Japanese? Madam says: Okonomiyaki is the Japanese equivalent of American diner food, not quite healthy, very much filling, and with regional styles. In this place, the daughter always does the cooking right there on the grill in front of the bar. I speak to Japanese people in Japanese with lapses into English when I can’t think of the word, or my brain gets tired. It’s horrible Japanese, but it gets the job done. My Japanese other-half goes crazy for okonomiyaki–but he’s a Kansai-jin, so it’s a little more brutally simple than the Hiroshima-style. The sauce and mayonnaise always put me off this dish; it’s like eating a sweet, fried salad. Oh, and don’t get me started on kaiseki!